Create a list of the ten greatest comic book heroes ever and it is bound to include Superman, Batman, Spider-Man, Wolverine, and Wonder Woman. Most would want add Captain America, Iron Man, and The Flash to that list. When his adventures were written and drawn by Carl Barks you would be hard pressed to find a more exciting comic book story. Starting in 1942 the artist created adventures for Donald that took the irascible, temperamental duck to the four corners of the globe. From Alaska to Africa and out into the Old West and over to India, Donald Duck tracked pirates, square eggs, and ghosts all over the world. Barks gave the Duck a fully realized, multi-dimensional personality and behavior that was often more human and more real than almost any other character in the history of the medium. 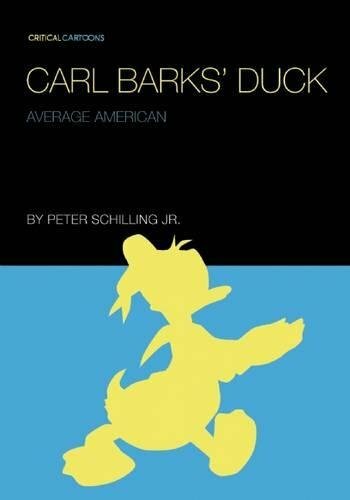 In Carl Barks’ Duck: Average American by Peter Schilling Jr., the author takes apart his personal favorites among the many stories written and illustrated by Barks. As he does he hopes to inspire those who haven’t read a good Barks adventure before to take a chance on the duck. Now let’s be sure of one thing, not all stories featuring Donald are equal. Across the seven essays included in this compilation Schilling makes a convincing case that the stories written and drawn by Carl Barks that feature the temperamental bird are some of the greatest adventures, and some of the most human and utterly enjoyable works of art in comic book history. Schilling regards the stories, as he says in his introduction, as “paper movies.” He approaches his subject with the same reverence, insight, and awareness that the late Roger Ebert brought to film. Which is fitting for in order to help illustrate his point he often relies on movies as a comparative example when writing about the work of Barks. In his essay about the classic Donald Duck story “The Magic Hourglass” he references Citizen Kane as well as Eric von Stroheim’s silent epic Greed. Such comparisons really help clarify what he is saying. By using our shared familiarity with another medium, Schilling expertly expands our understanding of another. He observes that when Barks wrote stories with Donald at the center, the duck becomes an actor in the same way that Cary Grant assumed a role. No matter what the occupation was in one of his films, Cary Grant was still essentially Cary Grant. The same idea applies to Donald. No matter what job Donald has taken on, photographer, chemist, or night watchman, if Donald has been hired he is still Donald. He doesn’t alter his personality the way that Meryl Streep does inside a role. We read these stories knowing that regardless of the situation, Donald is still Donald and he will act according to the behavioral patterns we have come to expect from Donald Duck. Not those of a chemist, gardener, or night watchman. This is no dry academic compilation. Schilling writes with the hope that the reader will become thrilled by the idea of discovering Donald in such a new light that they will seek out the stories he covers. With so much modern emphasis on superheroes it is easy to forget how incredibly popular comic books featuring Walt Disney characters were. In the late forties and into the early fifties Walt Disney Comics and Stories are rumored to have sold upwards of three million copies a month. During this period artists and writers were not given credit in individual titles. But fans knew what was good and what wasn’t. Issues with stories by “The Good Duck Artist,” as the unsigned work by Barks came to be known by fans, were always among the bestselling issues. Much of what drew fans to these stories is the way that Barks portrayed Donald as an everyman. The Duck faced the same problems that almost anyone did. He always needed to make some cash. He had schemes and dreams for how to succeed. Neighbors bothered him over an automobile. Maybe it was that his Boss at the new job rode him unmercifully. Relatives were mean to him. Especially another character brought to life by Barks, Uncle Scrooge. Schilling shows us example after example of Barks’ nearly limitless imagination. Throughout his essays he also reveals a dark side to the brightly colored world of Disney Comics when they were written by Barks. The book uses many panels from Barks’ work to illustrated detailed and nuanced interpretations of the writing and art in the stories he covers. There are 15 full-color plates at the end of the book as well. Much of what Barks wrote and drew conforms to millennia old archetypes of storytelling ideals. Like Icarus, the well-meaning duck, burdened by his shortcomings such as his fiery temper and selfish nature, somehow manages to come close to reaching his goal. Only to find at the end that what he has done may not benefit himself, but at least it will possibly help someone. Read in tandem with the ongoing series of reprints of the work of Carl Barks from Fantagraphics Publishing, Schilling’s collection of essays elevates the field of comic criticism and analysis. There is at least one person who believes that the greatest hero in comics was a lollipop-eating overweight youth named Herbie Popnecker. They need this book more than anyone.